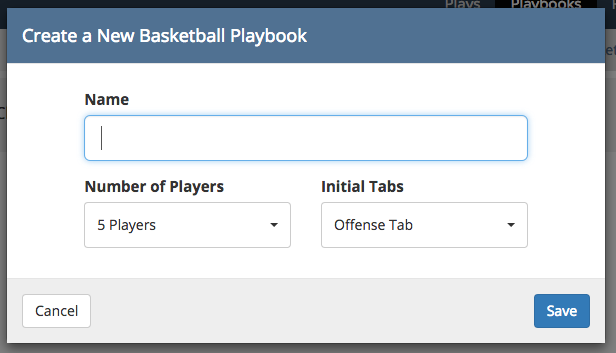 Choose a name for the playbook, the number of players (most applicable to flag football plays), and choose the initial tabs that the playbook will have. After creating a playbook you’ll be forwarded to the playbook designer where you can add and organize the plays in your playbook. to delete the current tab. You can also reorder the plays in a tab by dragging and dropping them within the tab or remove a play by dragging it out of a tab and into the available plays section. The left side of the playbook designer shows a searchable list of the plays that are eligible to be added to the current tab. To be eligible, a play must have the same sport and number of players as the playbook and not already be in the current tab. 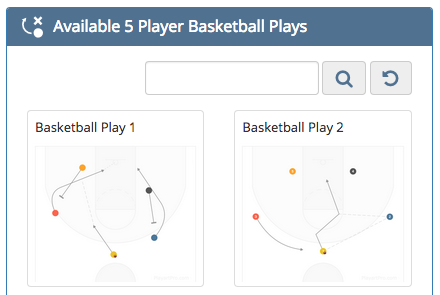 A play can exist in more than one tab in a playbook however. 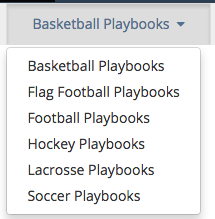 When searching for plays, Playart Pro will look for a match of play name or tags so it’s important to give your plays meaningful tags if you want to find them easily when managing your playbook(s). When you find the play you’re looking for, drag it into the current tab to add it to your playbook. to show a permalink for your playbook’s home page. The playbook home page is viewable by anyone but its link is not public so only you know where it is. It’s up to you to choose who to share this link with. to export your playbook to PDF. Unlike the playbook home page, this PDF isn’t available anywhere else on Playart Pro so make sure to download it to your computer so you can share it with your team.